As the official Destination Marketing Organization for Lebanon County, it’s our job to market and showcase all that the Lebanon Valley and the surrounding area has to offer visitors as well as our own community members. 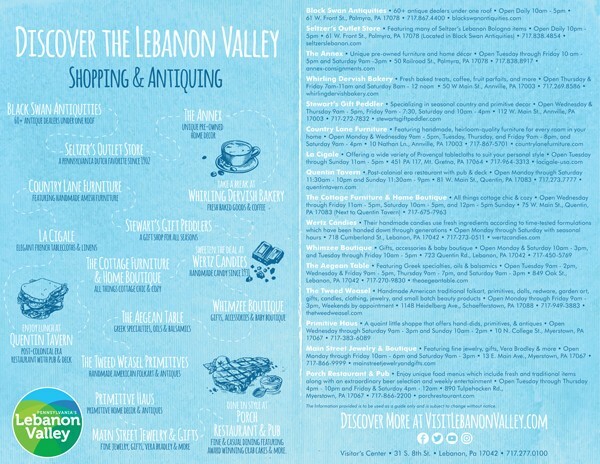 We produce tens of thousands of Community Guides for distribution throughout the Lebanon Valley and beyond. Our team personally explores local venues and businesses in an effort to showcase and promote what the Lebanon Valley has to offer. We attend bus and travel marketplaces in PA, MD, NJ, and NY to entice group travel. We utilize social media to highlight your special offers and events. Quarterly newsletters keep you informed of important news and statistics and trends in the tourism industry. We provide multiple networking opportunities throughout the year to connect you with other local business owners. Annual Partnership Meetings are held to recap our progress and inform you of what’s to come. Call us at 717-277-0100 for partnership details or fill out the form below to request your membership application. Share and use the pdf for optimal legibility and printing. Perfect for email attachments or website downloads! Use this link for ultimate compatibility and load time. Visitors can visit our site for an interactive itinerary experience. Download the companion image suitable for web and email teasers.